Looks like we are all goin’ up country folks! That’s right, this week we got to review a folk-country album (much to the joy of a certain Peter Maldjian). 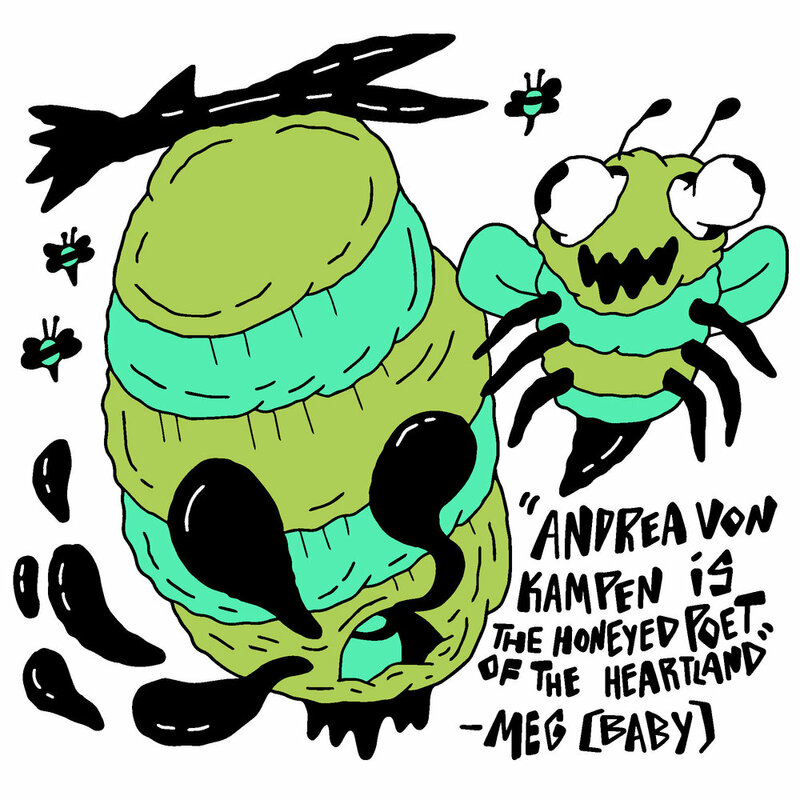 Andrea von Kampen is the honeyed poet of the Heartland. Every once in a while we stumble upon an artist that just really stuns me, to the point where I struggle to find the words to express any pertinent opinions. Andrea von Kampen has done just that -- I'm completely tongue-tied. A singer-songwriter in perhaps the truest sense, Kampen delivers an album composed of bright harmonies, cinematic vignettes, and genuine emotion. She keeps to the simple structure of vocals and guitar, but transcends it. Like an homage to songwriters of bygone eras, the album feels poignant and unique. Like a sweeter version of Laura Marling, with a melodic quality akin to Joanna Newsom, Kampen's delicate vocals swirl around carefully constructed and beautifully mastered instrumentals. It's pure poetry; sweet and lovely. There is a good mix of varied tempos throughout, all carried by her soft and emotive voice. Steeped in a bit of nostalgia, tinted with sepia, this music just soothes you and yields an immersive experience. Slowly, I drifted off into hazy wheat fields during golden hour, completely enamored. ﻿Thank you, Andrea von Kampen for Old Country! Finally, an Indie Folk album I really enjoyed. She immediately pulls you into her world with her very first track. The beautiful vocals are paired so perfectly with the instrumentals. I also love the thoughtful addition of the strings toward the end of this track. It is this type of attention to detail that make this a lovely album and I am sure will make Andrea a success. On the second track the great little drum beat kept perfect time and again worked well with her voice. Each song on the album seems to create its own mood and yet they all work amazingly well together. There are different instrumentals used on each to help develop this effect. I loved the song “Julia”, with it’s playful tone achieved through her vocals, guitar, and piano. Wahoooo! I must admit this is my favorite genre. I really enjoy the whole “singer-songwriter artist” thing and Andrea von Kampen certainly serves up something enjoyable. A stand out track for me was “Teton”; it was light and airy. Andrea sings effortlessly yet conveys such emotion, the sign of a true professional. “Try” is also light and airy. It opens up with soft finger picking, and this guitar work compliments the vocals throughout the entire piece. The vocals again are effortless and in perfect key, the string section pulls it all together to give it a classical sound. “Julia” makes for a nice ballad with classical piano, like a fine dessert of all the elements in perfect measure and it is delicious. This album feels very nice, a beautiful collection of songs performed expertly. This is a work that will truly stand the test of time. Old Country can stand alongside of such folk greats as Judy Collins, Joni Mitchell and the like. Grab a six pack of lone star and crank up the Andrea von Kampen. This album has quickly worked its way into my heavy rotation. Unfortunately, as is usual for albums I enjoy I have a hard time describing why they work so well. Please bear with me while I try to unravel my thoughts. To start, the sound on this album is fantastic. Almost every imaginable staples to a folky album make an appearance. Finger picked acoustic guitar, violins, lightly brushed snare drums, some kind of bass (stand up? ), a lead vocalist, even a little piano stuff. Seems like a pretty vast collection of instruments, but the way they each seamlessly flow in and out of each song keeps it from getting overwhelming. A stand out would still have to be Andrea’s vocals. The way it is swells and subsides with each track is hypnotic. Took me about four listens to finally commit to breaking down the lyrics themselves. That brings me to my next mind thread, string thing. The lyrics on this album. Gosh darn they are poetic. The stand out track lyrically for me was “Teton”. I am a sucker for a little scene building, and metaphors utilizing 18th century explorers. In all honestly though, the lyrics on this album lead to heaps of amazing moments. Similar to artists like Joanna Newsom, and Avery Mandeville (who we reviewed here) the lyrics lead the listener along through the story, and the songs meaning. That's all I got. Goodnight everybody. Andrea von Kampen’s music is gloomy, classy, folky that both haunts and soothes. The mood begins with the track “Tomorrow,” a bit of a spooky vibe, like candles lighting up an old victorian pirate ship or a haunting classic Irish folk song. Classy and just beautiful, so very beautiful. The mood steadily stays low throughout the album, sad, like you’re being weighed down and it’s raining, but it's so nice, and even uplifting somehow. “Try” is a gorgeous piece of music, really caught my attention and woke me up. Simple, but that guitar and her voice sound so right. Beauty and class and emotion wow. Then, “Julia” with that stunning piano. Lots of instruments come out on this album, each one producing the most lovely melancholy sounds. Gloomy and relaxed, sadness that makes you feel nice.